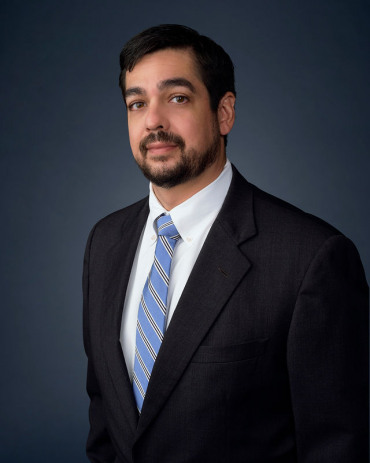 Andrew C. Desautel is an attorney at Meriwether & Tharp, LLC. He graduated from the University of Wyoming in 1998 with a B.S. in Accounting, and continued to the University of Dayton School Of Law where he graduated with his Juris Doctorate in 2001. Andrew moved to Georgia upon graduation from law school and has been practicing law as a member of the Georgia Bar since 2001. Andrew was born on Sheppard Air Force Base in Texas, and raised in a military family, which provided him the opportunity to live in different regions of the U.S., including Texas, Alaska, North Dakota, and Ohio. The frequent moving during his childhood emphasized the importance of family; specifically that “home” is not the building where you live, but where your family is. This experience has helped Andrew greatly in his family law practice to understand families in transition due to divorce or other issues that affect parents and children. Andrew understands that a client going through family law issues is experiencing emotional, stressful and scary times in his or her life, and that compassion and communication is necessary between attorney and client during these difficult times. Throughout his legal career, Andrew has mentored many young lawyers in several areas of practice, including family law. Andrew has extensive experience in litigation of all types, including complex civil liability claims, worker’s compensation, and criminal actions, but his passion has always been family law. Andrew has been practicing family law for almost 15 years, with family law being his primary area of practice for over 10 years. In that time, Andrew has helped hundreds of clients navigate through the difficulties of divorce, child custody and support issues. Andrew currently resides in Roswell with his wife and young daughter. In his spare time, he enjoys playing ice hockey, rooting on the Atlanta Falcons and Braves, and watching Disney princess movies with this family. "The attorney that did my divorce suddenly quit Family Law in the middle of my Contempt case and I was reluctantly assigned to Andrew. She had been top notch and he had some pretty big shoes to fill. Well, he certainly did not disappoint! Became a blessing in disguise and jumped right in without missing a beat. My case dragged on for a VERY long time and Andrew remained genuine and commited every step of the way. He was consistently calm and confident during this prolonged tumultuous time that at times became an overwhelming painful period for my sons and I. He is an excellent listener with a real talent for accurately reading people and the mood in the courtroom - he is humble and doesn't have that lawyer big ego dominating his every move. Furthermore, I never felt like he was padding the bill or doing unnecessary work. Andrew Desautel is a man of great character and integrity - a rare find in the legal world."